A former fishing village, now home to a collection of Phuket's most luxurious properties, Kamala is a town in transition. 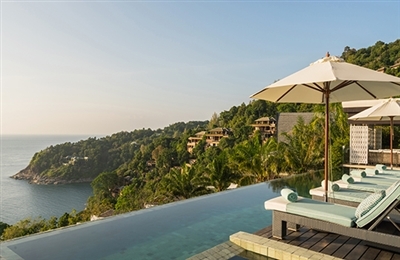 Set along a curving, white-sand bay on Phuket's west coast, Kamala has emerged as a more low-key resort destination than the neighbouring beaches of Patong and Surin, and something of an expat enclave. Families particularly enjoy Kamala's shallow sea waters and less chaotic feel, and fishermen-turned-tour guides now offer trips to nearby beaches on their traditional long-tail boats, still seen bobbing in the bay's south end. Local eateries and bars remain mostly casual watering holes – chilled-out Kamala has neither the hectic debauchery of Patong nor the swankiness of Surin. Shopping is done at local open-air markets or the small shops that line the village's streets selling tourist fare, beachwear and convenience items. Those seeking more upscale choices head north to Surin Beach (4km), to the Laguna Phuket Canal Village shopping centre in Bang Tao Beach (10km), or south to the Jungceylon shopping centre in Patong (15km). 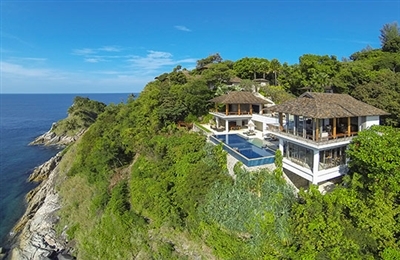 A few minutes south of Kamala town, yet a world apart, is the headland known as Millionaires' Mile, a luxury enclave where Phuket's most stylish and pricey resorts and private villas can be found along its stunning coastal road. 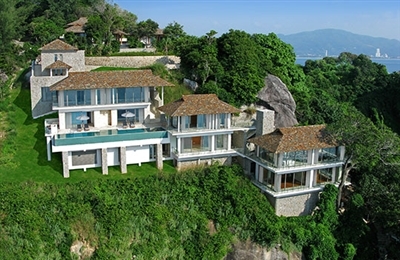 Among these is the smart Andara Resort, owned by Hong Kong's famed entrepreneur Allan Zeman, with its popular Silk restaurant, the Hyatt Regency Phuket and the five-star Cape Sienna resort, whose rooftop bar, Vanilla Sky, is a hot spot for sunset cocktails. Kamala is a 28km drive south from Phuket International Airport. Our stay at Villa Saan left us in no doubt that this is a fantastic choice for anyone seeking a tropical holiday immersed in style and luxury. 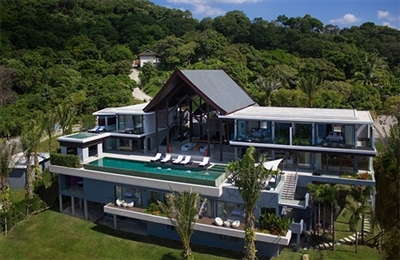 The villa’s exquisite design, with its grand entrance foyer framing wide sea views, adds extra WOW factor to its spectacular hillside location, and a clever four-floor layout provides ample shared space and plenty of privacy within each bedroom suite. Keeping cool is easy in the 19-metre infinity pool that appears to hover above the sea, and the jacuzzi set in the corner of the pool is just the spot for relaxation between swims. Fancy a more private soak? Just head up to the master suite and ease into the plunge pool on its private balcony, or lie back and relax in the suite’s outdoor tub. The two top-floor guest bedrooms also have bathtubs-with-a-view in their ensuite bathrooms. Though it was hard to drag ourselves away from the sea and sunset views, we did enjoy watching movies in the villa’s sumptuous private cinema. This, together with the games room and pool table, said to us that Saan is a villa designed for entertaining as much as relaxing. The staff here are especially thoughtful. We arrived on a day of inclement weather and, since a dip in the pool wasn’t an option, were asked if we’d like a bottle of chilled wine brought up to the master suite as an alternative. We agreed that this was an excellent idea! At Villa Samira we really felt connected to the sea and sky. The villa is blessed with all-encompassing views and fabulous sunsets, and with its sleek style and cool blue, turquoise and white accents, it emanated a luxury yacht-like ambiance that had us dreaming of long sea voyages as we floated blissfully in the pool. We think this villa would have extra appeal for groups of holidaying couples, with its three top-floor bedroom suites each offering lavish places to relax in privacy. Battles might be waged, however, over the master suite, with its coveted private jacuzzi set on the terrace and extra-large dressing room and bathroom. The three lower-floor guest rooms, though slightly smaller, still offer plenty of comfort and luxury.